Hyderabad Runners Society and Bharti Airtel together with the Govt. of Telangana unveiled the specially designed Finisher's Medals and Corporate Trophy for the 6th Edition of the Airtel Hyderabad Marathon. 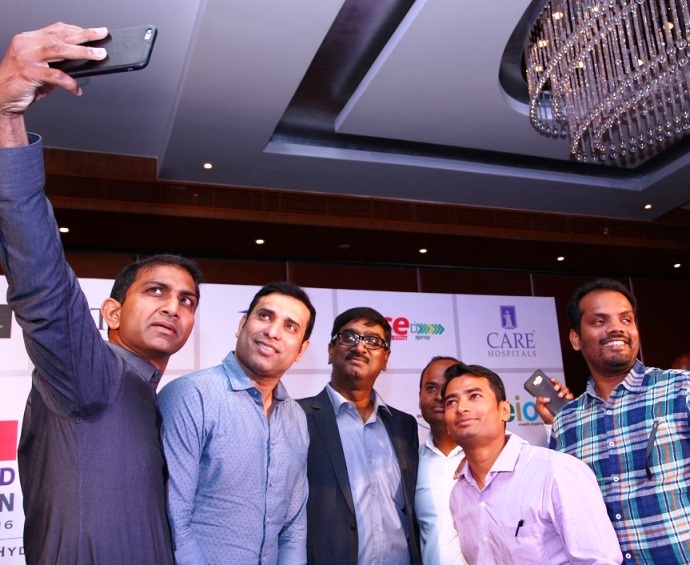 Former Indian cricketer VVS Laxman graced the occasion as the Guest of Honourand unveiled the finishers' medals and corporate trophy. The Corporate Trophyfor the largest corporate participant has been commissioned to encourage runners from large corporates and build awareness on promoting healthy lifestyles with running. All winners & finishers of the 4 categories of the Run (5K | 10K | Half & Full Marathon) will get beautifully carved designer medals. The prize money for the 6thedition is Rs. 7.2 Lacs for the winners in Elite | Male | Female category in the Marathon, Half Marathon and 10K Run Categories. The 5K Run on the 27th August is classified as a Fun Run with no prize money. However, participants in this run are encouraged to run in fun costumes to highlight their pet causes. The Government of Telangana is actively supporting the annual sporting event organized by the Hyderabad Runners Society, which is celebrating its 10thyear. The 2016 edition of this annual sporting extravaganza will be held on 27th& 28th August with active participation expected to be 16,000 runners. The Airtel Hyderabad Marathon has encouraged participation by the State Police, Paramilitary Police & the Armed Forces in the event. Dr. Phil Maffetone has been appointed as Event Ambassador for the 6th edition of the Airtel Hyderabad Marathon. Dr. Maffetone is a key proponent on health, lifestyle and fitness. He is most well known as the coach of Mark Allen, six-timeIronman World Champion. He has worked with other endurance athletes from professional baseball & football players, adventurers, NASCAR drivers, andOlympic Marathoners. Most importantly, he has worked with and helped thousands reach their goals of improved health and fitness. His “Big Book of Health and Fitness” serves as a bible for the healthy & active lifestyle, and his textbook, “Complementary Sports Medicine” is published in four languages. As one of the most popular and highly rated marathons in India, returns for the sixth year, over 19,000 runners, health & fitness enthusiasts, volunteers, medical personnel, city officials and police will come together and energize this sporting extravaganza with a curtain raiser – 5K Run on Saturday August 27th and onMarathon Sunday - August 28th 2016, the 10K, Half Marathon (21.095 km) &Full Marathon (42.195 km) will take place. The marathon route will traverse the important landmarks in the city giving the runners a picturesque view of the Hussain Sagar Lake, IT & Knowledge hub of HiTec City & Gachibowli while spreading the healthy lifestyle theme among Hyderabad denizens. Speaking at the media briefing, Dr. Murali Nannapaneni, Race Director said: “In this 6th edition of the Airtel Hyderabad Marathon, our focus first and foremost is on increasing runner safety & offering world class race amenities. This year will see extensive cheering bands & entertainment along the race route. Speaking at event, Mr. Venkatesh Vijayraghavan, Chief Executive Officer, Bharti Airtel Andhra Pradesh & Telangana said, “Airtel Hyderabad Marathon has gone above and beyond being a sporting event to a point where it elicits enthusiastic participation from the people of Hyderabad, either as a runner or as a supporter of this annual event. As we are priming ourselves for the sixth year of the Marathon this weekend, I am confident that the city will once again offer their unstinted support for this movement and encourage every runner coming from different parts of the country and overseas”. Airtel Hyderabad Marathon has now become synonymous with many things which are Hyderabadi. It owes the current status to the vision, passion and hard work of the members of Hyderabad Runners, the team that had introduced this mammoth racing extravaganza to the city of Hyderabad. Founded in 2007, a good four years before the Marathon began to run across Hyderabad, the group currently has around 3600 members. The members dedicated its endeavour to inculcate community running culture in the city and roping in people from all walks of life. Bharti Airtel Limited is a leading global telecommunications company with operations in 20 countries across Asia and Africa. Headquartered in New Delhi, India, the company ranks amongst the top 3 mobile service providers globally in terms of subscribers. In India, the company's product offerings include 2G, 3G and 4G wireless services, mobile commerce, fixed line services, high speed DSL broadband, IPTV, DTH, enterprise services including national & international long distance services to carriers.